The Jewish holidays are great for spending quality family time, but how about quality food time? 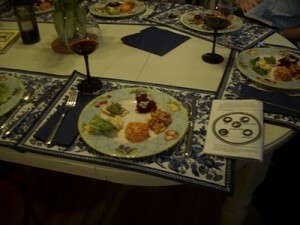 The first night of Passover is Monday, March 29, with the holiday lasting for eight days. Foodies, don’t despair. We have a list of great restaurants where you can observe the holiday and still satisfy your gourmet cravings. Here’s where you’ll find some traditional and not-so-traditional Seder meals for the first and second nights of Passover. This entry was posted on Friday, March 26th, 2010 at 3:49 pm	and is filed under Stuff to Do. You can follow any responses to this entry through the RSS 2.0 feed. You can leave a response, or trackback from your own site. Hi. I’m so pleased I discovered this blog, I really discovered this by accident, whilst I was looking around Google for something different, At Any Rate I am here presently and would just want to say thank you for the great blog posting along with a all round interesting web site (I additionally love the theme). I have bookmarked it and as well added your RSS feeds. Wow, this is very good info, appreciated. I really like what you post here, very refreshing and smart. One issue though, I’m running Firefox on Fedora and parts of your site structure are a little broken. I realize it’s not a common setup, but it’s still something to keep an eye on. Just tossing you a heads up. The question I ask is What are you cooking? goodto see you make postings on this topic, I should bookmark this web site. Just keep up the good job. My mother recommended your blog. I’ve bookmarked your site. Yes, you can refer to http://www.allny.com and http://www.travelandfoodnotes.com. i thought this was a really great post to read. i?ll check back for new posts by you! I like the helpful information you provide in your articles. I’ll bookmark your blog and check again here frequently! I really like this blog, definitely keep it up!! Thanks for this!! Great article!! Finally, a great article on this subject.. thanks!! I’ve been looking for something like this… definitely will be coming back!! Nice Post! I want more! Great info… I’m now following you on Twitter!! Definitely going to recommend this blog… thanks!! If you have suggestions for other topics you might like, let me know.